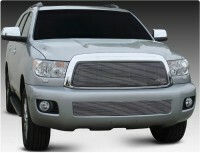 20903: 08-16 Toyota Sequoia Billet Grille Insert. This one piece billet grille insert comes finished in black powder coat with a highly polished chrome face. Installs into OE factory grille with modification required. Comes complete with hardware and installation instructions. Installation time is about 1hr. Matching bumper grille is also available above as additional item. (Bumper grille does not work with Road Sensing Cruise system.) Backed by manufacturers five year warranty. Made in USA. Tell your friends about the Billet Grille Insert. Share this product on Facebook, Twitter, MySpace or send an email to a friend!